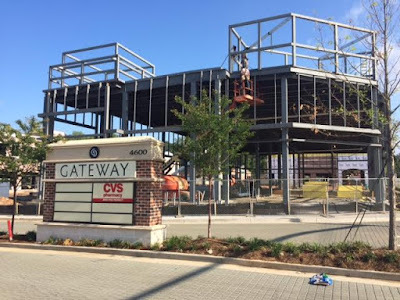 SRS Real Estate Partners is getting closer to delivering more spaces for their tenants at "Gateway" on Roswell Road, just inside Sandy Springs. Overall, the 21-acre mixed-use development consists of 100,000 square feet of commercial/retail space, a 20,000 square foot office component and 630 apartment units. The retail portion of Gateway will be anchored by a nearly 26,000 square foot Sprouts Farmers Market and an already open CVS Pharmacy. 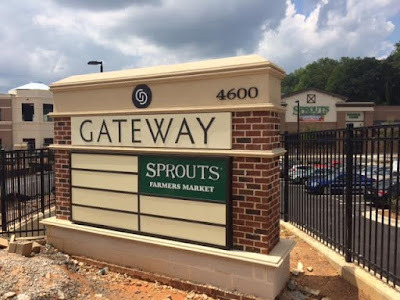 Sprouts recently opened their Roswell Market Place store in Roswell and plans to open the Gateway store September 2nd. 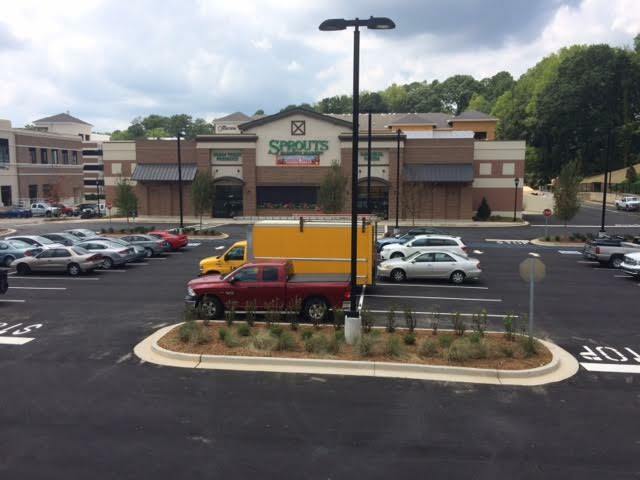 The Sandy Springs Sprouts will mark the chain's ninth store in the state. Previously announced tenants PNC Bank and Alon's are no longer involved in the project. Also, Little Alley Steak, once rumored to be interested in the project, is no longer in talks to be included. A real estate source tells me that none of the aforementioned would-be tenants are likely to end up in the project, but that there are active discussions with other prospects. I have learned that pH Wine Merchant, a store with an existing location in Peachtree Hills, will be opening, but under a different name: Corks & Caps. Yet another location of Salon Lofts has also been added to the project. The salon franchise basically provides independent stylists a cubicle, or large space, in which to meet clients and provide services without the costs of operating their own salon. Recent additions to the center include Buttermilk Sky Pie Shop, Kale Me Crazy and BLAST ELEVATE YOUR WORKOUT. Asheville, North Carolina-based Tupelo Honey Cafe and Birmingham, Alabama-based Urban Cookhouse, are the two restaurants I'm most excited about having nearby. In previous posts I have questioned the need for three new Mexican eateries in the development, or really, in the area. As it turns out, there will only be two: Chipotle Mexican Grill and Verde Taqueria. Cheeky Mexican Taqueria will not be opening in the project. Just "Cheeky" will reportedly be a sports bar concept, rather than a Mexican restaurant. Cheeky's founder, Jose Hevia, is no stranger to sports bars as he was a founding member of Atlanta's popular Taco Mac. The residential component, "The Collection," advertises that it is "now leasing" with studio, one, and two bedroom apartments available. A real estate source with knowledge of the development said most commercial tenants should be open by the first quarter of 2016. The realignment of Windsor Parkway, rumored by some to be the reason for the delayed openings, is reportedly not to blame. The realignment is not yet underway. Only recently were the buildings demolished and land cleared to make way for the road. What are you most excited about at "Gateway?" What new tenants would you like to see added to the project? Do you think too much was put into the project and that traffic will be made worse or will fewer people travel and instead stay close to shop/eat? Quite honestly, as a long time resident of the area, there's little to get excited about. Most of the tenants are redundant for the market and will take market share from long time established businesses. On top of that, the planning and architecture is pretty bad (in my opinion). Emory Point would have been a good one to copy. I guess multifamily developers should maybe just stick to multifamily. Once Little Alley backed out the food choices took a huge nosedive. Tupelo and Urban Cookhouse look about as basic as it gets. There are already plenty of better mexican spots including Bartaco and Superica down the street in Buckhead. In terms of tenants Sprouts and Tupelo Honey. As a Windsor Parkway resident of Brookhaven I'm just as much looking forward to the road changes, because the current backup onto Roswell Rd is brutal. Unless they can up the quality of the tenants in the future, the whole thing is going to be quite a disappointment. The only one I was looking forward to was Alon's, who isn't coming. Duplicate food types aren't needed, and who can get excited over a hair salon & another training center (gym)? Tupelo Honey is pretty awesome. There are a big lack of nice breakfast places up in this area. Buttermilk Kitchen has big wait times so this is another nice option. 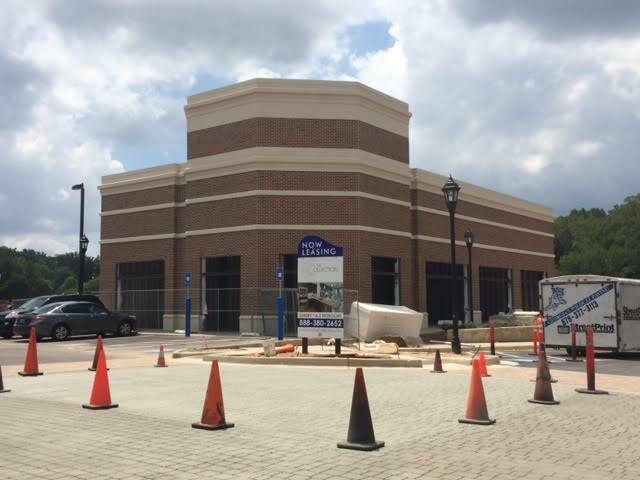 The remaining tenants will probably feel a lot like Town Brookhaven - boutiques. I think this project will be awesome for this area. I am most excited about Tupelo Honey, Urban Cookhouse, and The pie shop! I can't wait for it to open, and I think everybody will do very well in this area with the residential surrounding it and Chastain park. It will be so nice to grab some food at Urban Cookhouse to go and take it to the park for a little picnic. In terms of the retail/restaurant space, I think this project does nothing for the area. However, I do think tearing down the old apartments was good for the area (and school system). I also think it would be a decent place to live if I was young and looking to rent something. The proximity to the park is unique. But again, speaking as a long time resident of Chastain Park, it doesn't do anything for me or get me excited. Most of my neighbors feel this way. Why are you all-capping and shouting the name of the Blast workout place. No need to slavishly follow their corporate speak. I am delighted that Sprouts is the anchor. I wish they had left more green space or just space, the way Town Brookhaven is. Gateway already looks too crowded. But I do like the idea of desirable new restaurant choices. Yes, traffic will most certainly be much, much worse!! There is far too many businesses and too few places to park and manuever. Plus traffic on Roswell Rd and W. Weiuca is already jammed -- someone failed in their evaluation/approval to allow so much in so little space! God help us if there is ever an emergency in this complex and surrounding areas....obviously a new training endeavor for fire and rescue along with the thousands of new clients swarming to Sprouts & Total Wine 7 days/week not even to mention new shops and eateries. Unbelievable! I agree about the traffic. I don't live in the immediate area but this is clearly the worst choke point for north Buckhead congestion on Roswell Road. Why put such a huge development in an area in which traffic is already a huge issue? It makes no sense. Developers continue to screw things up all around this city in adding huge new developments to areas that can't handle any more traffic, whether it's Gateway, the new Kroger at Lindbergh or the new Sprouts at Cheshire Bridge and Piedmont. No one seems to give a second thought to the gridlock that will result from this out of control development. With the exception maybe of Sprouts, it is another piece of valuable land wasted for another salon and cheap eateries. Really frustrating how these projects are planned. Alon's would have been great; maybe a nice local bistro... But please stop adding nail salons and fast foods everywhere. This is not what we need here! It is amusing that so many people have such good ideas for other people's property. I live in the area... and am really excited, strange to see people so negative about it. Sounds like some people are just scared of change.... change can be exciting and good. Also we are getting a great gym opening in the old Rite Aid building, Knuckle up , an awesome kickboxing gym, Sprouts, and some healthy places to eat... how cool to live by the park and have that development close enough to walk to! I work within walking distance of the development and live nearby as well. There's not much to get excited about. Verde will be a nice addition to the neighborhood. The one thing I was looking forward to was Alon's - oh well. And when the Roswell Road and West Wieuca intersection turns into mass gridlock, blame Sandy Springs. They refused to allow any of the impact fees paid by the developer to be used at that intersection because it's in Atlanta, not Sandy Springs. I love that Sandy Springs is vying to become a more walkable neighborhood. Note: in order to be considered "walkable," sidewalks are required. There are none leading into the development. Spotty all up and down Roswell Road. Hoping the city of Sandy Springs has sidewalks in the works, too, so we can all walk to Sprouts! I live in Meadowbrook (walking distance to Gateway w/ plans to walk to/from 90% of the time). Would everyone please remember the seriously dated apartment complex that this project replaced, and also keep in mind that businesses largely select locations based on geographical proximity to potential customer base vs. current competitive environment/coverage? For those complaining about more traffic, welcome to Metro Atlanta. I am very excited about this project - I am up and down that area of Roswell Road at either 8am or 5pm and do not hit traffic. I have been to Sprouts several times and the staff couldn't be nicer! I think it's a MAJOR IMPROVEMENT over the over crowded apartments that were there. What an upgrade for our neighborhood and I love having more options nearby to grab dinner or run errands. I hope more wonderful tenants sign soon as we plan to be there often.